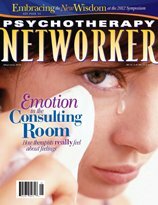 This issue maps out not only what the latest science tells us about how emotion works, but also how therapists can more fully acknowledge within themselves the embodied experience of emotion in the consulting room, and consciously put it to use in clinical work. After all, psychotherapy effectiveness studies increasingly tell us that the most important factor in every approach is the connection between therapist and client. Neuroscientists recently established emotion is the prime force shaping how we cope with life’s challenges. Psychotherapists are beginning to learn how to work with emotion, rather than trying to control it and create change through purely cognitive or behavioral means. Resonating with clients’ inner experience is key to working effectively with emotion in therapy. With traumatized and shutdown clients, however, it is easy to talk about, but extremely hard to do. Our understanding of what happens when we weep hasn't progressed much beyond Freud's theory of catharsis. However, knowing how our nervous systems work can help guide what we do—and don’t do—when clients burst into tears. Too many therapists today confuse the healing release of tears with the helpless despair triggered by reliving traumatizing memories in therapy. Andrew Weil, Mary Pipher, and Dan Siegel, along with 150 other presenters, not only helped the Networker Symposium celebrate its 35th anniversary, but illuminated a new vision of the integrative mental healthcare of the future. The SoLoMo revolution is transforming the way therapists can generate client referrals on the Internet. For men who still consider entering couples therapy a stroll into a lion’s den of shame, humiliation and failure, a men’s groups can be both a crucial source of support and a kick in the pants. Bestselling author and retired psychotherapist Mary Pipher makes a case for therapists’ having the know-how to become effective social activists---and for why saving the environment isn’t such a lost cause. Daniel Kahneman, the founder of behavioral economics, has written a comprehensive dissection of the reasoning mind, which should be on every therapist’s required reading list. The father of an 11-year-old struggles to master the language of gruntology.